What if I said volunteering to cook the holiday meal for your family or friends this year could actually reduce your gluten-free holiday stress? Sounds implausible, but it’s true. You may spend a lot of time in the kitchen. You may have to experiment a bit in advance. But in the end you will have control over the meal and can make everything gluten free. Then everyone can enjoy the holidays the way they ought to be enjoyed: eating fantastic food in good company without worrying about getting sick. The holidays roll around every year without regard to where you are in your gluten-free journey. You might be brand new to gluten-free cooking and unsure where to begin or a veteran with more kitchen confidence. No matter what stage you’re in, hosting the holiday meal can be an opportunity for gluten-free brilliance. You might even convince friends and family that gluten-free foods can be delicious and deserving of their place on the holiday menu instead of just a sorry second. But getting everyone to the table could be a challenge when family traditions are at stake and a move to your house might be resisted. Here are some way to cope with that issue and others when hosting a gluten-free holiday meal at your home. 1. Keep traditions intact as much as you can. Family and friends will be more accepting of a new location if they know traditional favorite foods will still be served. You know what foods conjure up Thanksgiving, Christmas or Hanukkah for you; now find out the favorites of family and friends. Their answers will give you menu ideas and insight into your guests’ expectations. Once you pick the menu based on your priorities and their requests, you will be in the driver’s seat. 2. Review recipes for your holiday menu and determine where you need gluten-free substitutions. Gluten-free cookbooks are more than just a collection of recipes. They often include a lot of information on ingredients, what they can do for your gluten-free cooking (i.e. thicken, bind, add flavor) and what you should use when substituting ingredients. Then practice, practice, practice. Some gluten-free substitutions work perfectly, others may not. But you won’t know until you try it out. 3. Keep things as simple as you can. Gluten free or not, preparing a holiday meal is a lot of hard work. Early on figure out menu must-haves, find and test recipes and then prepare everything else in the easiest way possible. Gluten-free turkey or ham is easier than taking on homemade gluten-free lasagna. Mashed potatoes and steamed green beans tossed with olive oil, garlic and pine nuts may be a simpler choice than gluten-free au gratin potatoes or that green bean casserole. Gluten-free potato latkes for Hanukkah can be made with your regular recipe if you substitute gluten-free flour for wheat flour. And bread? Gluten-free cornbread is easy to make and can be used in stuffing or as a side dish. Companies specializing in gluten-free foods have really stepped up in recent years and using their products can make things much easier. Gluten-free stuffing mixes are easy to find online or at your local natural foods store or supermarket. Readymade gluten-free pie crust and dough are showing up in stores’ refrigerated and freezer sections, and most pie fillings are gluten free. Left over pie crust dough baked with cinnamon and sugar on top is a perfect holiday left over treat. Amy Leger and her daughters prepare their holiday dinner. 5. Don’t make a big deal out of announcing that your meal is gluten free. Gluten-free guests always need to know about the food they’re eating, but you don’t have to put everyone else on notice. “I never tell anyone what is gluten free until the end of the meal,” Suzy Heller of Andover, Minn., says. She cooks gluten free for her 10-year-old son JD. He knows the whole meal is safe for him. Heller says her guests don’t pre-judge the food. “I take a lot of time and care in preparing JD’s food … he deserves something good, everyone does,” she explains. This approach will work best if you want to make the entire meal or have guests who aren’t likely to bring unexpected contributions to dinner. If your family or friends are bound to show up toting a casserole, a pie or anything with gluten, you may be better off being upfront about your plan to make a completely gluten-free and delicious holiday meal. 6. Whatever you decide about advance gluten-free notice, if a guest asks what to bring, tell them and make sure it’s an item that is naturally gluten free. It will be easier for them and for you. Ask for a bottle of wine, soda or a vegetable or fruit tray. By giving guests specific things to bring, you will get some help, plus your guest will feel like they have contributed to the meal. And you can maintain the gluten-free nature of your holiday feast. If you have let everyone know you are serving a gluten- free dinner and someone still comes with a gluten-filled contribution, remember it is your meal. You can politely thank the guest and put the item aside. Skip the gluten-free lecture but don’t feel pressured to serve the gluten-free food if you don’t want to. Pie or cake can easily be cut into smaller servings and sent home with guests who are not gluten free. 7. 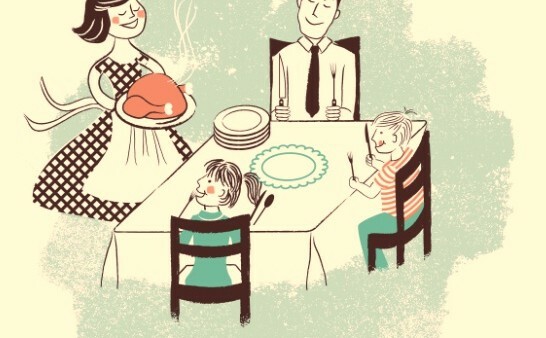 If you are nervous about well-meaning relatives and friends coming into the kitchen to help and unintentionally contaminating the food (for example, topping the green beans with butter in the fridge that’s been cross-contaminated with wheat bread crumbs instead of using the designated glutenfree butter), assign them risk-free tasks. Chopping vegetables, setting the table, pouring the drinks and washing dishes are all things that can help you without jeopardizing the meal. Hosting a gluten-free meal for the holidays can be a lot of work, but it can also be rewarding. You get to put your gluten-free cooking skills to work and gain more experience pulling off a grand-scale, exclusively gluten-free meal. Gluten-free family members and guests get the chance to fully participate in the important ritual of sharing food. With a little planning and practice, you can have an awesome gluten-free meal steeped in tradition and good taste. Just be prepared. Everyone may immediately start planning to come back next year. 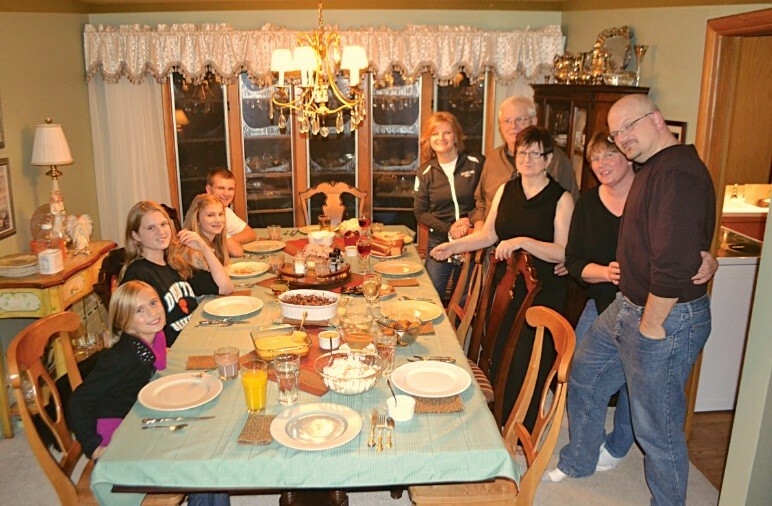 Amy Leger’s family celebrates the holidays. • Xanthan gum is the key to successful gluten-free baking. Add about 1 teaspoon to every cup of gluten-free flour. Available in stores nationwide. • The breaded onion rings mixed in the casserole and used to top it are still a challenge. Some people skip them and top the beans with crushed potato chips or gluten-free corn flakes or crackers. Others make homemade onion rings. 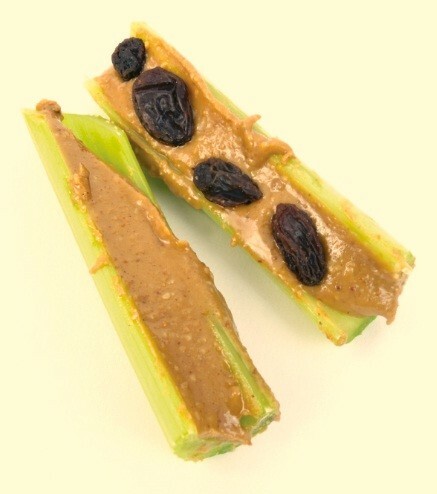 Cut celery into sticks. Spread peanut butter onto the sticks. Top with raisins. Lay one to two pieces of ham down overlapping enough to make sure it will cover the entire pickle. Pat the pickle dry. Spread a layer of cream cheese on the ham. Roll up the pickle into the meat. Allow to chill for one to two hours, then cut into ½- to ¾-inch slices, insert toothpick in each slice and lay on a tray to serve. * Make sure all ingredients are gluten free. Amy Leger is the Family Editor of Gluten Free Living. She founded thesavvyceliac.com and has a daughter with celiac disease. She recently published an e-book, The First 30 Days Gluten Free.